We recently posted 10 Reasons to Visit Argentina Right Now, but in case you needed even more motivation to visit South America, we asked Taste Vacations partner, Greig Santos-Buch, the founder of Winederlusting.com, to provide 6 tantalizing reasons to tour Chilean Wine Country. For those of us who have a thirst for adventure, legendary scenery and complex wine without the price tag, one country is emerging amongst seasoned wine travelers as THE go-to New World wine destination. That country is Chile. But specifically, what makes this South American destination so special? To begin, Chile is the second longest country in the world just behind Brazil. It spans roughly 4300 kilometers from North to South, with its widest point reaching no more than 356 km (only 112 miles!). The snow-tipped Andes Mountains dominate the landscape to the East, with the majestic Pacific Ocean and Coastal Mountain Range bordering the West. To the North, you’ll find the Atacama Desert, which offers some of the clearest and driest skies in the world — a premier destination for stargazers. If you travel far to the South, you’ll eventually run into Antarctica, but not before passing through beautiful Patagonia. 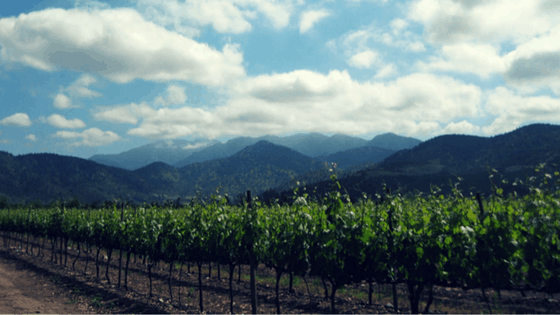 As more and more producers from around the world become conscious of Chile’s undervalued terroir, the country has recently exploded with a number of high-quality wine producing sub-appellations. These span almost the entire length of the country, beginning as far North in Atacama as Valle Copiapo, all the way down to Valle Osorno. Aside from a diverse array of soil compositions and microclimates, innovative producers are crafting deliciously balanced and refined white and red wines. Many of which you’ll likely already be familiar with (Cabernet Sauvignon, Syrah, Sauvignon Blanc and Chardonnay stand out particularly in quality). Plus, since the country is still so undervalued on the wine front, some of the finest wines of Chile can be acquired at local wineries and stores for as little as 2,000 CLP. You can learn more specifics about Chilean wine regions and their grape varieties on Winederlusting.com. A grape originating from and once believed to be best suited to the terroir of Bordeaux, France, Carmenere has essentially become Chile’s premier grape variety. This luscious red grape commonly produces black and red fruit forward wines, with no shortage of veggie-esque flavors — not unlike that of green bell pepper. The largest area of Carmenere production is concentrated throughout Chile’s Central Valley, although plantings span as far north as the Maipo Valley — near Santiago — all the way down to the Southern appellation of Valle Maule. This grape is so popular to both locals and foreigners alike that there’s actually an entire festival dedicated to its greatness during the third week of March every year in the Maule Valley. Chile is a convenient travel destination, but not because it’s necessarily easy to get to or navigate. Rather, it’s located near several other highly sought-after travel destinations. 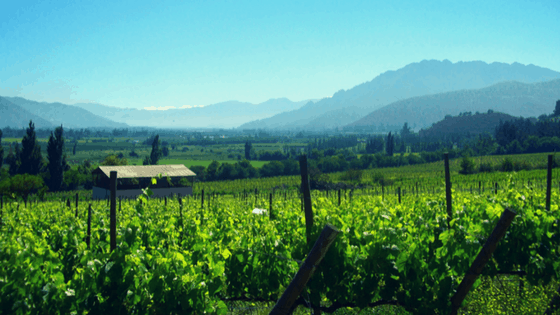 For those of us looking to taste the best wines of South America, Chile’s Central Valley is also conveniently located next door to Argentina’s Mendoza wine region. 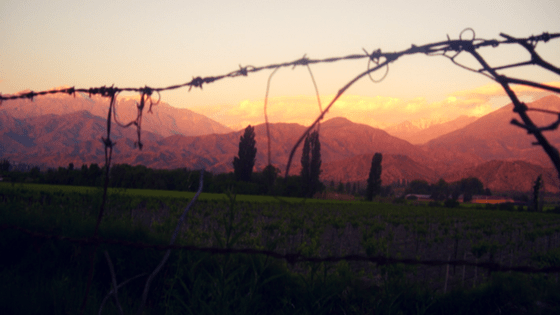 If Carmenere is the Chilean Central Valley King of Grapes, Malbec is undoubtedly Mendoza’s. On the other hand, if you’re the kind of traveler that craves unparalleled outdoor scenery and hiking, Patagonia offers some of the finest in the world. Nomads and families alike who are looking to travel on a budget will enjoy touring most of Chile, although the further South you venture towards Patagonia, the more expensive things tend to get. In Central and Northern Chile, cost of living is just about half that of London, and public transport is widely accessible and cheap. In recent years, infrastructure throughout the country has improved dramatically, with very well maintained highways, bridges, and roads. Although there is an incredible amount of geological diversity throughout the country, the best wine producing regions (Central) receive a Mediterranean climate. For the most part, one can expect long, warm sunny days, with cool and crisp evenings. Snowmelt from the Andes helps to hydrate vines during the Summer season, while Winter tends to bring more rain. Even if you travel to Chile during the Winter (which happens to be Summer in the Northern Hemisphere), the season is often referred to as a “just-so Winter” — indicating that they can be chilly, but not obnoxiously cold. 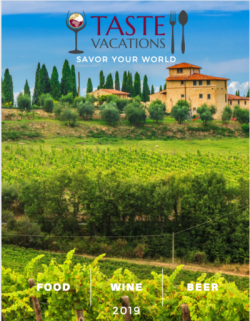 Winederlusting.com, a Taste Vacations partner, is a premier media source for all things travel and wine. Our aim is to help our audience learn, grow and better plan their wine journeys around the world. We think of wine as a vessel. A method that aids in tapping into the richness of life’s fruits. Travel is the best way to acquire true wisdom; Wine is just a hug in a bottle that makes the journey that much more pleasurable.